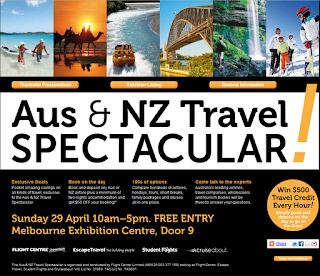 Leading tourism operators across Australia and New Zealand will come together for a one day only "Aus & NZ Travel Spectacular" hosted at the Melbourne Exhibition Centre on Sunday, 29th April 2012. Expo hosts Flight Centre are excited to present travel enthusiasts with a rare opportunity to compare hundreds of airfares, tours, cruises, hotels and experiences on offer throughout Australia & New Zealand. Tourism experts will lead free 30 minute presentations throughout the day, packed with advice and travel ideas for attendees. "Whether your ideal holiday is an outback adventure or sipping cocktails on a private island, this event will have you covered," says Saxon Templeton, Flight Centre's Marketing Manager VIC/TAS. "Come along knowing what you want or in need of inspiration, and leave with the holiday of your dreams." The Aus & NZ Travel Spectacular truly caters to all tastes and age groups, providing a unique one stop shop for anyone who likes to travel. Even the kids will be entertained with free face painting and meet and greets with Wiggles favourites, Dorothy the Dinosaur and Captain Feathersword. All attendees will receive $50 'Expo Cash' that can be redeemed on any booking of airfares and a minimum of two nights' accommodation simply by attending. Travel credits of $500 are available to win every hour throughout the day for anyone booking and depositing a holiday at the Expo. Australia's first close-to-home Travel Expo is a day of one-off special deals that will make booking a holiday anywhere in Australia & New Zealand an easy decision. Diamonds of Australia and Asia cruise.